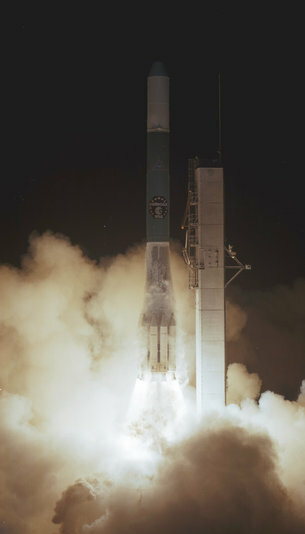 ESA’s first Earth observation satellite was launched on 23 November 1977. When the first Meteosat satellite took its place in the sky, it completed coverage of the whole globe from geostationary orbit and laid the foundations for European and world cooperation in meteorology that continues today. Weather – and particularly extreme weather – affects everything we do. Being able to see the whole disc of Earth allows forecasters to see developing weather systems, as well as working out wind speed and direction based on cloud movements. Atlantic hurricanes appear on Meteosat images long before they interact with land, and data from space help to predict their tracks. Before weather satellites, forecasters relied on surface observations from land, ships and buoys, along with some information about the atmosphere provided by balloon-borne radiosondes, kites and aircraft. Satellites provided a vast new array of information that, coupled with new computer models, helped to make forecasts more reliable for longer periods. Meteosat was an important milestone in European cooperation in space. Individual countries had pioneered monitoring of the ionosphere from space and the European Space Conferences of the 1960s agreed in principle that there should be a European weather satellite, but it was not until Meteosat that the potential for meteorological satellites began to be fulfilled. Meteosat was initiated as a French project, with involvement both from CNES and the French meteorological service. At the same time, the European Space Research Organisation (ESRO, a forerunner of ESA) was considering possibilities for polar-orbiting and geostationary satellites. ESRO decided on a geostationary satellite, which would clearly be a duplication of the French effort. Over a long period of fact-finding and negotiation, the foundations were laid for the Meteosat project to evolve from a French one to a European one. Rather than uproot the whole operation from France, it was decided to establish an ESA office in Toulouse, from where Meteosat could be developed and guided. Meteosat-1 lifted off at 13:35 GMT on 23 November 1977 from Cape Canaveral in Florida. It reached its operational orbit on 7 December 1977, and its first image was sent back on 9 December. It was the first satellite in geostationary orbit to have a water vapour channel to track the motion of moisture in the air. The new satellite required great improvements in ESA’s computing power – both for telemetry and for image data processing. From its position over the Greenwich meridian, Meteosat-1 could scan Earth’s full disc every 30 minutes, with the data being provided in near-real time to users. Since the launch of the first Meteosat, 40 years of imagery and derived meteorological data from it and its successors have helped to significantly improve weather forecasting. There are 35 years’ worth of Meteosat imagery available online and the satellite’s record of imaging from space constitutes an important body of evidence in climate science. Although the early meteorological satellites were not envisaged as tools for measuring climate change, images of changes in land cover or polar ice and data on sea-surface temperature have become very useful for climate research and modelling. There was a gap of almost a decade between the launch of Meteosat-1 and the official founding of Eumetsat, the European organisation created to exploit satellite data for weather and climate research with the global community. Today, with clear operational responsibilities and funding, Eumetsat has become a global player in satellite meteorology. With 30 member states, Eumetsat continues to develop new satellite programmes in cooperation with ESA. The Meteosat programme always has one satellite in the operational position at 0º longitude. Meteosat Second Generation kept the drum-shaped design of the original but is two and a half times larger and offers improved resolution, 12 spectral channels as opposed to three on the original system, and faster scanning. Looking to the future, Meteosat Third Generation is in development, with new capabilities such as lightning detection, and will guarantee continued European monitoring of the atmosphere from space into the 2030s.